"Cats are smarter than many people think, at least when it comes to hydrodynamics." The Telegraph is reporting on the results of one of the most important scientific experiments of our time: How cats drink milk without getting their chins wet. Over a span of three and a half years, physicists, engineers, and mathematicians from prestigious institutions such as MIT, Virginia Tech, and Princeton University discovered that, "cats have just the right combination of fluid dynamics, gravity to inertia ratios and a mathematical dimensionless number to drink." "It was known from a 1941 study that when they lap milk, cats extend their tongues in a backwards 'J' – meaning the top of their tongue touches the surface first. But recent high speed footage has shown that the top surface is the only part of the tongue to touch the liquid – meaning that unlike in dogs, where the tongue is fully immersed and used as a ladle, a more refined technique is at work. The tip of the cat's tongue scarcely brushes the liquid's surface before it is rapidly drawn back. This forms a column of milk between the tongue and the surface, which the cat captures by closing its mouth. This column is created by a balance between gravity pulling the liquid back to the bowl, and inertia – the tendency of a substance to move in a given direction until another force intervenes. 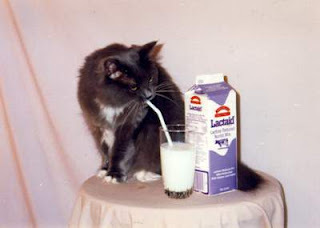 Cats instinctively know how to strike this balance in order to time the lapping and to capture the liquid in their mouths, according to journal Science. A fraction of a second late, and the liquid would be pulled back into the bowl as gravity overtakes inertia, meaning the cat's mouth would remain empty." Fluid mechanic(!) Roman Stocker's cat, Cutta Cutta, inspired him to work on the project. Stocker said: "Science allows us to look at natural processes with a different eye and to understand how things work, even if that's figuring out how my cat laps his breakfast." Guess they won't be doing any "got milk?" ads anytime soon...MOL!!! Also.......cats aren't even supposed to drink milk! Yesh, but we love it so. Mum gives me almond milk (teeny bits) I wonder if that is ok.